Tickets for the National Football League Final,Dublin V Cork in Croke Park on Sunday 26/04/15 MUST be ordrered by Friday 17/4/15 at 7pm. Adullts â¬20, Juveniles â¬5. Please Text Tom on 0872345947 with orderes. There was no winner of this weeks Lucky Dip. Numbers drawn4,11,13,31. Jackpot is now â¬2890. No winner of this weeks Lucky Dip. Numbers drawn 13,28,30,32. Next weeks Jackpot is now â¬2290. Annual Lotto tickets are due for renewal NOW. Contact any Committee member to renew your ticket or purchase one for the year ahead. make sure not to miss a draw for the entire year. Membership must be paid in full by March 31st in order to be considered eligible for tickets for Dublin Championship games should there be limited availability. Please contact any committee member to pay membership ASAP. There was 1 winner of Lucky Dip. Numbers drawn 1,6,13,36. Jackpot next Sunday is â¬630. Congrats to winner. No winner of this weeks Lucky Dip. Numbers drawn 2,8,20,32. Next weeks Jackpot is â¬4810. Looking to get some Insurance??? Why not consider the official partner of Dublin Gaa AIG. 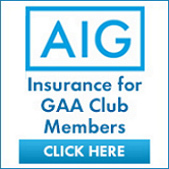 As part of AIG's continuing support of Dublin Gaa they are offering all Clann Mhuire members 10% discount on Insurance products. Click on the link at the bottom of page to avail of this great discount. We are currently looking for a new manager for our AFL4 team ahead of the commencement of the 2015 season. Please contact 087-2697391 for more information.